Faran Johnson is a highly experienced change and transformation professional who has recently been appointed as the Managing Director of Engage for Success, formed to promote employee engagement as a better way to work that beneﬁts individual employees, teams, whole organisations and the country. Her 30 year career spans both the private and the public sectors, operating in senior line, consulting and Board roles across Private Equity, Financial Services, Entertainment, Retail and Media organisations. She specialises in both large-scale workforce and HR function transformation, from strategy design through to execution; from behavioural, cultural and leadership change to improving organisational performance. Faran’s recent role as the HR Director with Her Majesty’s Courts and Tribunals Service saw her playing the lead people role in one of the single largest digital transformation programmes currently being implemented in the public sector. 1. Modern Settings – this includes modern buildings and also digitallyenabled processes to remove paper from the justice system. 2. Modern Capabilities – we will equip our people with the skills and knowledge to perform in the modern, digital world; treating them with fairness and respect. 3. Modern Technology – building what the users of our services need, and adjusting in an agile way. The third part will bring digital technology into HMCTS and how justice is administered. Preparing our staff to operate in a digital age is a key pillar of our people capability strategy. We have developed a peer-led, bite-sized training approach to building digital conﬁdence across our operational staff. The pilot of this programme has shifted digital conﬁdence by 24% and introduced a structure for social learning. We have also built our ﬁrst digital learning products for staff who are starting to work in new ways. As far as possible, we want people to learn in the same way they work. This has been a huge change for people working in HMCTS but the learning products have been well received. Antonia Dietmann is Deputy Director of Organisation Capability at HM Courts & Tribunals Service (part of the Ministry of Justice) supporting employees through the largest reform of the justice system in history. Early experiences researching workplace bullying amongst teachers and sexual harassment in the Armed Forces impressed upon her the negative impact of when relationships at work go wrong. As such, she is passionate about the fundamental need for meaningful work relationships as a key driver of successful business outcomes. This partly involves giving employees a voice in shaping their experience at work and supporting leaders at all levels to create space for employees to contribute. To do this Antonia brings psychological evidence and creativity together to deliver sustainable interventions at a large scale. These draw on her experience of nearly 15 years’ as an Occupational Psychologist with expertise in research, culture change, leadership and talent development, engagement, inclusion, and wellbeing. Dom is joint head of the employment team at international law ﬁrm Taylor Vinters. He is highly-regarded for his wealth of expertise advising on complex and business-critical HR situations. He has particular experience in helping employers deal with sensitive workplace disputes, senior level exits and restructuring projects (often across multiple jurisdictions). Dom writes and broadcasts regularly on a wide range of employment and HR issues, with a speciﬁc focus on how businesses are preparing for the future world of work. He is also one of the partners responsible for Taylor Vinters’ graduate recruitment programme. Emma Milton is Head of People Capability at HM Courts and Tribunals Service (part of the Ministry of Justice) supporting employees through the largest reform of the justice system in history. Emma has worked in three Government Departments – Department for Work and Pensions, Cabinet Ofﬁce, and now Ministry of Justice. As well as more generalist HR experience, she has expertise in talent and performance management, people data and workforce planning and people capability. Emma’s most recent roles have focused on supporting employees through change, which is where her passion lies. In her current role, Emma is responsible for understanding HMCTS’ current and future capability needs and implementing a strategy to meet those needs. Peter is an international employment lawyer – he supports businesses in the UK and across the world with tricky (or potentially tricky) situations involving their people. Clients tell him they appreciate his feel for managing sensitive reputational and commercial issues, not just the legal detail. He joined Taylor Vinters as a partner in 2018, having practiced employment law and industrial relations at leading ﬁrms in London and Melbourne, Australia. He provides strategic advice to multinational and domestic clients in a range of sectors including technology, the creative world, sport and ﬁnancial services. Are the Robots Coming? What Every HR Professional Needs to Know About AI in HR Megan Butler, PhD Candidate, Leeds University Is AI real? How is it impacting HR? How can professionals navigate this new technology? This session is designed for HR professionals to gain a basic knowledge of what AI is, an overview of why they should care, and some examples of AI in action through case studies. Anyone with no knowledge to some understanding of HR tech will ﬁnd this session informative and hopefully develop a curiosity to learn more about AI in HR. As a PhD candidate at Leeds University and research analyst at CognitionX, Megan works closely with both industry and academia to map the market, understand the technology, and provide insights and advice to HR professionals and business leaders. Since its launch in January 2018, the Taylor Vinters Zebra Project has brought together a select group of business leaders, creative thinkers, academics and innovators to explore the opportunities arising from the future world of work. We are already seeing the reinvention of business and employment models enabled by signiﬁcant technological advancement. For many, purpose and value are outplaying proﬁt as business drivers. Crowds and platforms are emerging as new ways of resourcing ﬂuctuating demands for products and services and the rate of AI adoption is impacting on the skills and quality of jobs for the workforce of the future. Our Zebra events have sparked ideas and stimulated debate about how organisations can succeed in this new environment. Twelve months on, we reﬂect on what we’ve learned so far, where the future of work discussion is now heading and the opportunities it presents. The Future of Pay James Herbert, Founder & CEO, Hastee Pay Technology has empowered us to control nearly every second of our lives, yet we still have to wait until payday for the cash we’ve earned. In 2019, we believe that that shouldn't be the case. Hastee Pay is an award-winning employee beneﬁt that companies can offer to their workforce, which empowers employees to receive a portion of their earned pay immediately, to increase their choice and ﬁnancial wellbeing. Companies proﬁt from the improved productivity, engagement, recruitment & retention of their workforce, with zero cost or impact on company cash-ﬂow. There is no interest to pay, just a small, simple fee. We will look to share insight into the market, provide examples of success through case studies of those using Hastee Pay already, help you in understanding the signiﬁcant uptake seen by those brands (up to 40% of staff), and provide an overview of how Hastee Pay works and how it can help you and your workforce. DIGITAL WORKPLACE DIRECTORS FORUM A competitive and social person who thrives on a challenge, James is inherently curious, creative and driven. These characteristics, eclectic experience and a desire to create positive and lasting change combined to light the fuse that started Hastee Pay. Prior to founding Hastee Pay, James founded Brightsparks during his ﬁnal year at Durham University, where he studied Economics. Brightsparks has since gone on to directly employ over 16,000 people to work within Events and Hospitality and is involved in some of the UK’s most prestigious events. Along the way, James has been fortunate enough to be involved in a range of great business, including as an investment banking graduate at Cazenove and an analyst within Lloyds of London. Victoria Silverman is a global engagement specialist who gets results by creating the content and strategy to inspire collaborative behaviours and create the right culture for a business to succeed. Her background is in journalism, teaching and corporate storytelling. Victoria leads global employee engagement for Innovation at Thomson Reuters, now Reﬁnitiv, delivering record breaking, award-winning campaigns. Victoria has worked for Deloitte, ITV and the Government in editorial, corporate comms and change management roles. In her spare time, she is director of The Missing Manual Ltd, founder of the parenting online community BeTeenUs.com, and a communications lead for the charity Urban Synergy. Shades of Grey… An Exploratory Study in Team Engagement Sharon Olivier, Senior Faculty and Discipline Lead for People and Talent, Ashridge Executive Education In potentially the largest UK study of barriers to engagement in teams to date, researchers from Ashridge Executive Education at Hult International Business School, on behalf of Engage for Success and supported by Oracle, worked with 195 participants from 28 teams across seven industry sectors. When comparing work teams across the study, our ﬁndings suggest that there are ‘shades of grey’ when it comes to team engagement, opposed to teams by simply being either engaged or disengaged. Consequently, we identiﬁed four zones of team engagement as well as three meta themes that have the largest impact on team engagement. This research challenges traditional binary notions of engagement or disengagement in an increasingly digital workplace environment and questions whether engagement surveys present the true story when it comes to team engagement. Konica Minolta Case Study: Providing Tech For Good Gemma Lee, Head of Transformation & Ashley McConell, European Intrapreneurship Programme Lead, Konica Minolta Business Solutions UK Ashley will share how he turned an innovative idea into a reality at Konica Minolta, resulting in Konica Minolta partnering with The Big Issue charity to provide engaging content for readers, improve the lives of vendors through increased sales, and ultimately dismantle the social stigma and common misconceptions around The Big Issue vendors. Gemma will contribute to this story and share how fostering a culture of innovation within Konica Minolta, is encouraging employees to be creative and make things happen, aiding digital evolution for Konica Minolta and its partners. Sharon teaches, researches & consults in Career/Competencies, Architecture, Strategic HR, Leading in the 21st century, Ego/Eco-system leadership, Team Engagement, Polarity Management, Diversity and Inclusion, and Personal Resilience. Before Ashridge, Sharon spent 20 years as a Senior Manager/OD consultant/Learning Facilitator/Coach/Speaker. She started her career as HR Manager in the Motor Industry, then led Human Capacity Building in a large consulting company, after which she established a successful consulting practice (Impact Consulting) in South Africa. Clients have included Audi, BMW, Land Rover, De Beers, Anglo, Sage Life, University of Johannesburg and Sasol. Sharon holds a MA in Industrial Psychology and a Management Advanced Programme Certiﬁcate. She is a Master Practitioner in NLP (neuro-linguistic programming) and a PNI practitioner (psychoneuroimmunology). She has established a track record as an inspirational speaker at conferences on the topics of the future of HR and leadership. She has co-published a book on resilience “Diamonds in the Dust” and a chapter in the latest Ashridge leadership 2017 book “Inspiring Leadership” on ego and eco leadership intelligence. Sharon has recently co-published and presented research papers on Ego, Eco and Intuitive leadership, Team engagement and Mindful leadership. With authenticity in marketing driving big brands to take new approaches, how should internal marketing and communication respond to reﬂect this hot trend for 2019? Discover how brands are changing tact and what it means for your audiences inside companies. How do you ensure authenticity in everything you do to put ‘buy-in’ and advocacy on a new footing? 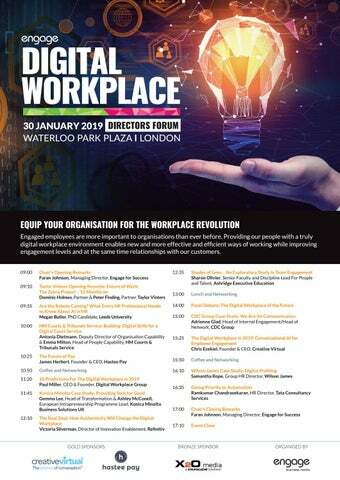 The session will explore the pros and cons of identifying digital inﬂuencers, innovative ways of engaging employees and techniques to increase your impact on a daily basis. Paul will share his industry-renowned (and in previous years, mostly accurate) forecasts for the digital workplace in 2019. This year, for the ﬁrst time ever, Paul has included a “Grand Prediction”, which is one overarching change that he feels will be felt most signiﬁcantly in the year ahead. Also, for the ﬁrst year ever, Paul has added to each prediction a ‘Bigger Picture’ outlook - so there is lots to discuss. modelling and design. Ashley is always looking for ways to create new ways to work with partners, with a keen focus on providing tech for good! The case study you will hear today was an idea he brought to life after being impacted by a conversation with a Big Issue seller. Paul Miller is CEO and Founder of Digital Workplace Group. His book 'The Digital Renaissance of Work’ (co-authored with Elizabeth Marsh), was shortlisted for the CMI Management Book of the Year 2016 Award. Paul’s previous book, 'The Digital Workplace: How Technology is Liberating Work', coined the term “digital workplace”. Paul has given many inspirational talks on the digital future of work, for audiences at Microsoft, IKEA, Google, Accenture, Harvard Business Review, Cisco, European Commission, Adobe and Oxford University. He hosts the global industry podcast ‘Digital Workplace Impact’. He was ranked one of the world’s Top 50 Social Employee Advocacy Leaders in 2015. He is Executive Producer of the 24-hour global digital experience 'Digital Workplace 24'. Prior to founding DWG, Paul was Founder and CEO of communications company The Empowerment Group; Publisher and Editor of social and digital innovation magazine ‘Wave’; and, in preinternet days, co-founder of the Ideas Café salon. He now lives in the Cotswolds in the UK. Connect with Paul on Twitter: @paulmillersays and Linkedin. Enabling our customers to transform service provision through technology is fundamental to our business. With accountability for the group wide People Strategy Sam will lead the internal digital transformation to support our workforce of over 5000 employees across 150 sites. Having led several signiﬁcant people and technology transformation programmes, Sam’s latest challenge requires a digital people strategy which connects and engages employees from a diverse workforce, who are often based off site and have limited corporate technology infrastructure. Sam will share her challenges in identifying and designing an employee digital proﬁle to inform the employee digital transformation plan. Adrienne Glad, Head of Internal Engagement/Head of Network, CDC Group Working across multiple locations, whether regional or global, is challenging enough, but creating internal messaging and connecting colleagues in a meaningful and inclusive way can add even more complexity for a communications team to consider. An intranet can help, but that is only one tool. Adrienne Glad, Head of Internal Engagement for CDC Group, talks about the approach her organisation took in building an internal communications function, introducing a new intranet and getting people engaged with storytelling—and each other—through a ‘We are all communicators’ campaign. Adrienne is the Head of Internal Engagement/Head of Network at CDC Group where she has built a new internal communications function at the organisation over the last two and a half years, while deﬁning and shaping its culture as it grows and expands globally. Prior to that, she spent 9 years at Pearson where she held global roles focused on strategic internal messaging, engagement and relationship-building. Adrienne has lived in the USA, Japan, China and UK each for several years and holds a Master’s of Education in Applied Linguistics, a Master’s of Research in Intercultural Communication and is currently doing her doctoral research on organisational culture, business management and anthropology approaches to corporate values and internal culture. Sam is accountable for the group wide People Strategy which incorporates the Security, Construction Logistics and Aviation divisions within the Wilson James Group. Prior to Wilson James, Sam held several HRD roles across the public and private sector. Her experience has seen her lead signiﬁcant people and technology transformations including deployment of cloud based people solutions, using technology to enable mobile and ﬂexible working and supporting integrated learning for complex partnerships. Prior to working in HR, Sam had a 15 year career in recruitment, working at board level in both the UK and Australia. Here she delivered a range of solutions including RPO for large blue chip organisations where technology transformation enabled improved service delivery and organisational efﬁciency. Two years into the launch, MFDM has been a phenomenal success. TCS is one of the fastest growing IT services companies in the world, clocking a double digit growth even at such a large base. However, automation did not lead to loss of jobs; rather, it led to better career and more jobs, not only for TCS, but also for customers who implemented the solutions. Automation is not about eliminating jobs- it is about eliminating bureaucracy, wastage and organisational politics that bogs down people and keeps them away from focusing on things that they should focus on. Automation is about helping work become more meaningful. This session provides speciﬁc examples in the HR department and how automation can not only eliminate bureaucracy but make HR jobs more meaningful. Chris Ezekiel has been working in the world of virtual assistants since 2000 and founded Creative Virtual in November 2003. Employing his technical and entrepreneurial skills, and through the development of the enterprise level V-Person™ technology, he has established Creative Virtual as one of the world’s leading providers of virtual agents, chatbots and live chat. Today Creative Virtual’s virtual agents are having over 60 million conversations per year. The company was honoured with the prestigious 2017 Queen’s Awards for Enterprise in the category of Innovation and was listed as one of Britain’s fastest growing private technology companies in the 2018 Sunday Times Tech Track 100. • HR Director, Tata Consultancy Services (TCS) – UK& Ireland; TCS UK is one of the largest IT services Company in UK with more than 18,000 employees and £2 Billion+ in revenue • Global experience of 20 years spanning different countries (United States, India and UK) • Previous roles include Head of HR of Retail Business Unit in TCS, and Head Stafﬁng – TCS North America (based in New Jersey, United States) and several other leadership roles • Recognised in TCS for key initiatives in HR Transformation, Mergers and Acquisitions, Leadership Development, Employee Health and Safety and deployment of HR practices at scale across the organisation • Certiﬁed Compensation Professional, Bachelor of Law (B.A, L.L.B), M.B.A (HR), Gold Medalist in Indian Constitutional Law. Coffee and Networking Wilson James Case Study: Digital Proﬁling Samantha Rope, Group HR Director, Wilson James The Wilson James group provides safe, secure, customer-led solutions to more than 300 clients across the UK and Europe. Wilson James have been raising standards for over 25 years across three core service lines; security, construction logistics and aviation services. In security, our SIA licenced security ofﬁcers provide protection for a business, its assets, people and reputation. Security experts advise on the latest security technology including CCTV, alarm systems and data, as consultants help mitigate risk whilst adding genuine value to each client. Ramkumar Chandrasekaran, HR Director, Tata Consultancy Services In 2017 TCS CEO, Mr Rajesh Gopinathan, launched the Machine ﬁrst delivery model as a strategic priority that will take us into future. Simply put, MFDM will provide machines the ﬁrst right of refusal - it meant that TCS , as a part of our technology solutions, will give priority to automation and, only when that is not possible, will we look at a solutions involving human intervention. There was some anxiety among our employees - what does in mean for the future of 400000 employees? TCS is one of the largest employers in several countries and one of the highest recruiters in many markets. We hire about 35000 people annually – what happens to job creation? Improving employee engagement is a top priority for many organisations in 2019 as they come to better understand the beneﬁts of providing better and easier support for employees. Organisations are also coming to understand that many of the same digital tools they are using to improve their customer experience can also be leveraged to improve their employee experience. Chris will outline the essential components for using conversational AI solutions to improve the employee experience, from best practices for implementing chatbots, virtual agents and live chat to using an orchestration platform for centralised, consistent information delivery. Drawing on experience and calling up live demos, Chris will explore how combining AI with human input and feedback loops can drive better employee engagement. 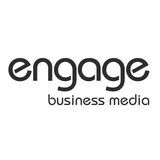 Engage Employee is part of Engage Business Media Ltd.